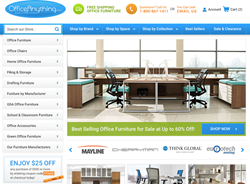 The new OfficeAnything.com responsive website is ready to take the furniture and seating world by storm. With cutting edge features and an incredibly user friendly design, the office makeover process just got fun! OfficeAnything.com provides an improved furniture shopping experience. Not all office furniture companies are created equal. OfficeAnything.com has truly raised the bar. This industry leader has upped the ante in 2016 with a well thought out responsive website specifically designed to provide a simplified shopping experience across all devices. The new OfficeAnything.com layout is fully geared towards the customer. The site makes the office makeover process a fun and rewarding experience. Cutting edge features like the all new “quick view” tool allows shoppers to save time while viewing in-depth product details without the need to flip back and forth between pages. When asked about the new site capabilities, owner Phil Swindle said “What truly sets OfficeAnything.com apart is the new mobile store”. We fully agree. He went on explain how business executives are constantly on the go, and the need for a simplified mobile furniture shopping site was more evident than ever. Professionals want the ability to purchase a new desk while they're at the airport or waiting in the lobby for an important meeting. The user friendly format of their new mobile store answers the call. You can efficiently browse thousands of products right from your smart phone. 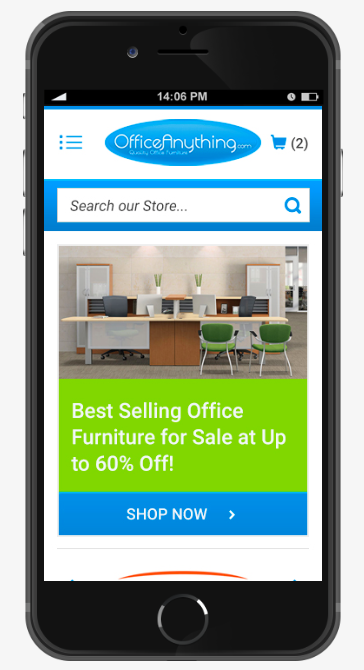 The mobile store highlights featured products, best sellers, sale items, and much more to streamline the search process. As searches across mobile devices will dominate 2016, OfficeAnything.com is sure to capitalize on this growing movement. When the time comes to choose new office furniture for the home or business, you’ll be met with a large selection that can be overwhelming to say the least. OfficeAnything.com has solved this common problem with their new responsive website. Shoppers can use the horizontal navigation bar to shop by item, brand, and space. The left hand navigation menu is highlighted by an advanced search bar that works across all devices. The products highlighted on all internal category pages can be sorted by price, brand, and even popularity. An innovative responsive website has OfficeAnything.com ahead of the curve in 2016. This trend setting brand is sure to become a household name and a favorite amongst interior design teams. With more than 6,000 products available, finding what you need, when you need it is easier than ever. OfficeAnything.com provides executive office desks, comfortable ergonomic seating, powered conference tables, reception furniture, and professional storage solutions with free nationwide shipping. Pair that with everyday low prices that can’t be beat, impeccable service, and the most user friendly new furniture site on the web and you’ve got a recipe for success! OfficeAnything.com mobile storefront.The OfficeAnything.com mobile store simplifies shopping for professionals on the go. 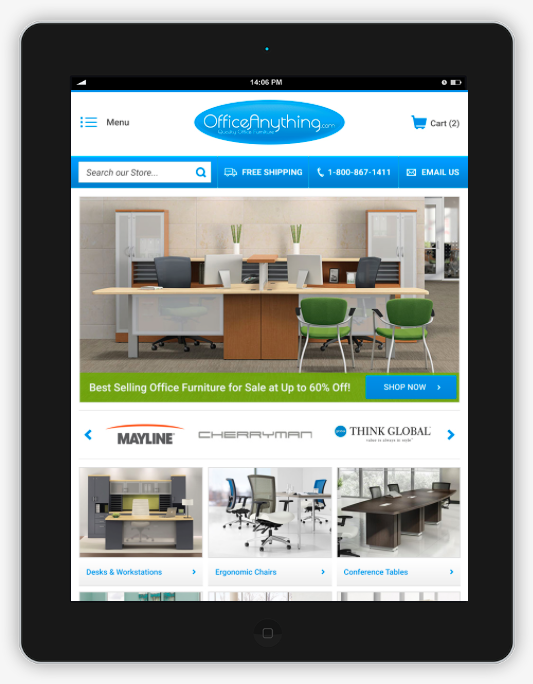 Use your tablet to effectively shop for new office furniture.OfficeAnything.com tablet view.